Do you remember where you went or who came over for one of the biggest milestones of your elementary school life? What event you may be wondering, since at that age there are so many ‘firsts’ to choose from– your first sleep over. The youngest son finally got to have one this Fall and if you could die from excitement– he’d have been a goner. Everything had to be perfect–even dinner, so when he requested spaghetti pie (and let me know he actually meant a spaghetti pie) I knew I had to come up with something to fit the bill. He thought my idea for a baked spaghetti pie with pepperoni sounded perfect. Looking back, I was just as excited as he was. I so wanted to welcome a new kid into the fold. It’s always so exciting. But I forget that sometimes the chaos and constant motion and noise in our house can be overwhelming to newbies. As can my meal time routines. I’m all business calling out orders– telling my troops to get to the table and plate up. It works for us. It does not work for a kid with extreme food aversions who’s not used to being in a new environment, or forced to sit at a kitchen table for meal time, and then put on the spot with whether they’d like Parmesan cheese on top or not. In my defense, I just said ‘everybody take a seat’. Anyway, we were all a bit unprepared for when tears just burst forth and this child sat sobbing at the dinner table. The classic combo of spaghetti and meat sauce are layered into a spring form pan with layers of shredded mozzarella, that create a mouth-watering cheese pull when slicing, and studded with chopped pepperoni. It’s a bit of a twist on an old stand-by meal for us, but it added just the right amount of fun for the youngest son to think it was super cool. Plain ol’ sketti is good enough for any night, but this upgrade is his first choice for special occasions suppers. A fun new spin on baked spaghetti, this dish is easy to make and just as endearing as the regular version. Cook the spaghetti al dente, according to the package directions. Drain the spaghetti in a strainer and run under cold water for a minute or two to stop it from cooking. Set it aside. Crumble up the sausage into the same pot that you cooked the spaghetti in. Brown the sausage over medium high heat, using a sturdy spoon or spatula to break it up as it cooks. Stir in the spaghetti sauce and let it simmer- stirring occasionally- for 6-8 minutes. Turn the heat off and transfer the spaghetti to the pot and gently stir to combine until it's evenly incorporated. Add 1/3 of the pasta to the bottom a 9" nonstick springform pan. Arrange half the pepperoni slices over the pasta, then top with 1/3 of the cheese. Repeat. Top the second layer with the remaining pasta. Cover with foil and bake at 375 degrees for 30 minutes. Remove the foil, add the remaining cheese and return the spaghetti to the oven for another 15 minutes. Remove the baked spaghetti from the oven and let it rest for 20 minutes (it needs this time to 'set'). Remove the outer ring of the pan and using a sharp knife, cut the pie into slices and serve warm. Serve this baked spaghetti dish with a side salad and garlic bread for a fun, filling meal. Yum!!! Poor kiddo, I couldn’t imagine having another child bursting out crying 🙁 so happy that this made up for the little guys lost sleepover. This looks to die for. Putting this on my list! Oh no! Poor kid! I can just imagine what people must have thought eating with my family growing up! There were six of us and things could get loud and crazy at the dinner table (still can!) 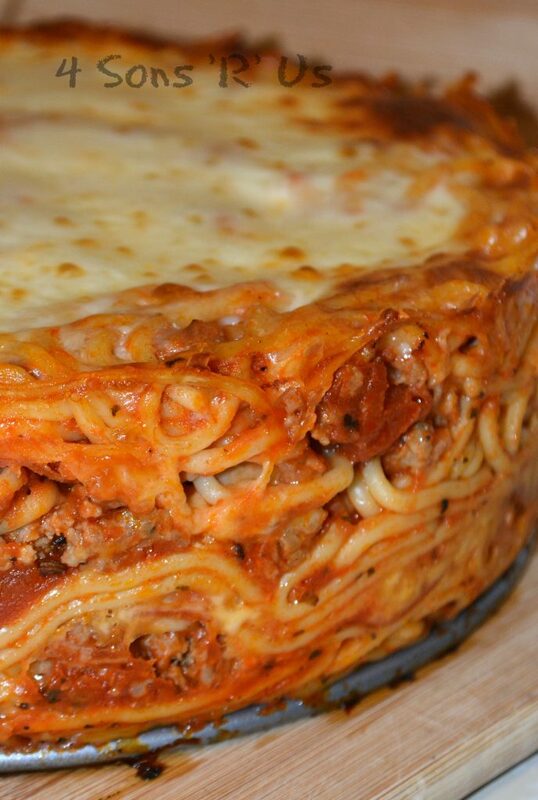 The spaghetti pie does look delicious! So sorry about the sleepover, but glad you managed to salvage the night and this recipe looks perfect! My kiddos would love this one, I’m pinning! Thanks so much for linking up at You Link It, We Make It. Hope to see you back tomorrow! Don’t have a spring form pan. . . will a 9″ pyrex glass pan work? 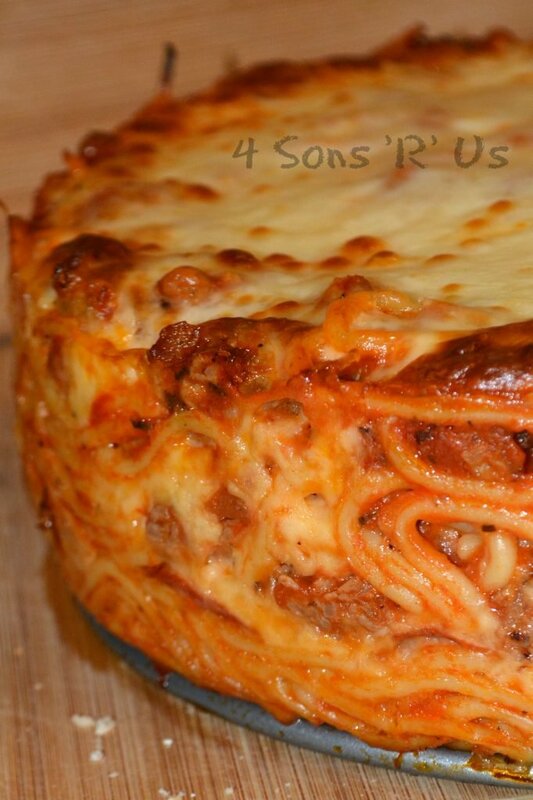 I love spaghetti pie, and so does my son. It is so yummy. I make mine in a 9 inch glass pie dish and it feeds four, with leftovers for the next day. 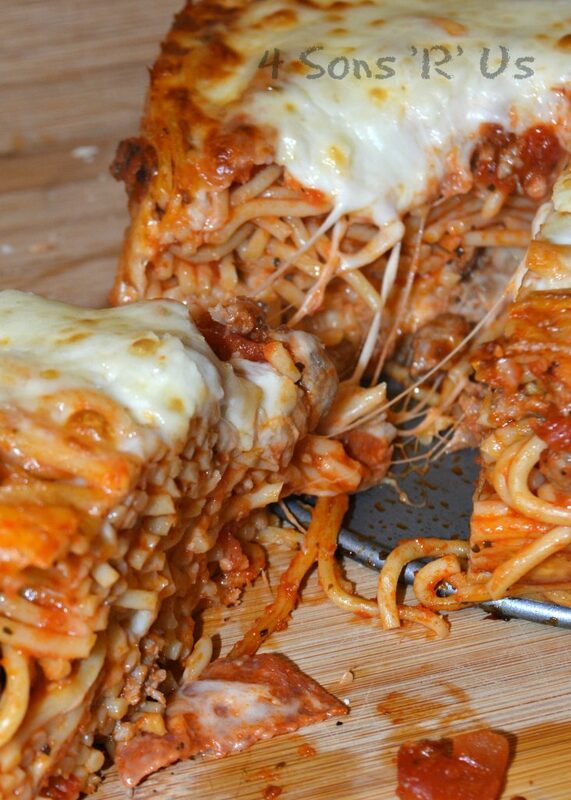 I give spaghetti pie a 5+ rating It is that goooood! You’re right, it’s sooo good, and most definitely one of my kids favorite ways to enjoy leftovers!